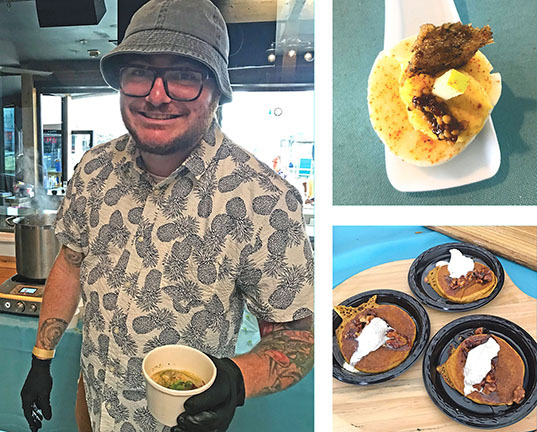 On a gorgeous Sunday morning, October 7, the bayside Rusty Rudder in Dewey swarmed with sponsors, donors, and foodies reveling in the sunshine and divine tastes from some of the finest chefs in the area. The event was the 16th annual Meals on Wheels Celebrity Chefs’ Beach Brunch fundraiser and included tastings by top beach chefs, craft beer, wine, and brunch cocktails, along with a silent and live auction plus the outstanding music of the Bettenroo duo. While raising money for the much-needed Meals on Wheels program here in Sussex County, the by no means secondary intent was to be one of the most popular meet-and-greet, dining, and beverage fests of the year. One short column is no match for the expansive kitchen and distillery talent on display that morning, but I have to mention the ones I found to be the most inventive and delicious. But don’t get me wrong, everybody there, cooking, working, tasting, organizing deserves the kudos. My first stop, mimosa in hand, as I sought a breakfast entry, was Crust and Craft, serving Butternut Squash Whole Wheat Flapjacks. No mere pancakes, they were topped with wet walnuts and whipped cream. Decadent. Kill me now; I had two. From there I found Bluecoast’s exquisite deviled egg, served with a bit of scrapple and deliciously divine seasonings. It was so good I enjoyed the scrapple. A first for me. Following a few peeks at the auction items, a tune or two from Bettenroo and DJ Nan, plus lots of socializing, lunch tastes appealed to me. grandpa (MAC)’s/a(MUSE)’s offering, by chef Hari Cameron, fit the bill, with his new take on old fashioned chicken and dumplings. Hari calls it New Delaware Style, made with heirloom chicken, stoned wheat dumplings, parsley, and a bit of egg yoke. It’s from Hari’s entry in America: The Cookbook, and it’s amazingly brand new and familiar at the same time. JAM Bistro (East of Eden)—I love that descriptor! I can only rave so much about their duck pastrami with Gruyere cheese without seeming like a crazy person. It was amazing, inventive, and the taste station was mobbed. And last, but by no means least on my Best Of list, comes Fork and Flask at Nage with their Duck Rilette on sourdough crostini with whipped goat cheese. Oh my.